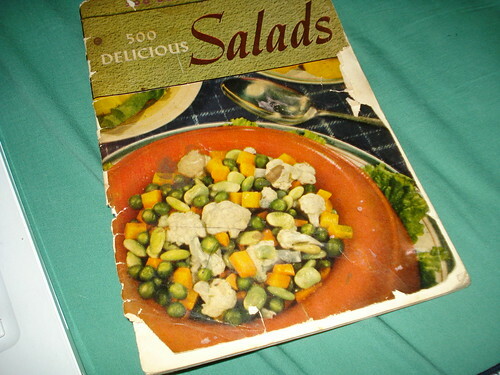 500 Delicious Salads is the second of three of these pamphlets I have that date from about 1940 and offer rather fewer recipes than advertised. Last month we tried out 500 Tasty Sandwich Recipes, and they were not bad. I thought the salad book would offer a lot of options, and it did, if I liked gelatin or tongue or shaping pear halves and cottage cheese into bunnies. (Which are kind of cute, in a creepy way.) 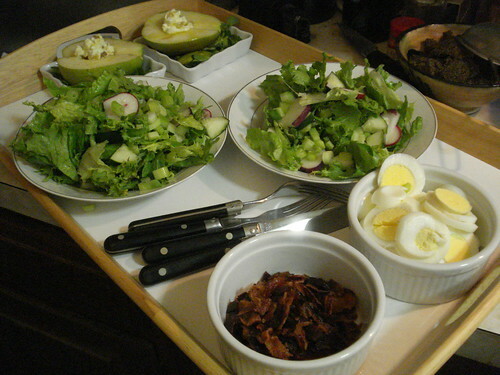 But I found two recipes fully worthy to try: pear salad with ginger cheese, and supper salad bowl. Supper salad bowl is effectively a hearty tossed salad, with bacon and hard-boiled eggs as the protein offering that makes it a complete meal. (More bacon, you say? Well, yes.) I did not have a wooden salad bowl, which is kind of a shame; the recipe directs you to rub a cut garlic clove all over the surface of your bowl, and I suspect it didn’t have the same effect on our plastic Tupperware bowl. 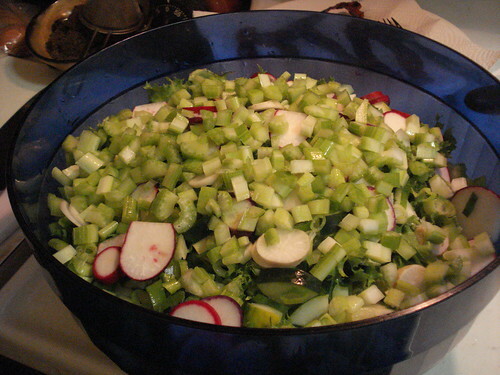 But I did it anyway, and proceeded to layer in lettuce (no specifics given; I chose green leaf), chicory, cucumbers, scallions, radishes and celery. I was supposed to add tomatoes as well, but I didn’t have any and by the time I realized that I didn’t feel like running out for some, particularly since my only nearby options would be your standard mealy and flavorless grocery store tomatoes. If I do this again I’ll have to make sure I plan around a Greenmarket shopping trip, because the tomatoes would have been a nice complement to the chicory. Chicory was a bit of a surprise to me, actually; I’ve never used it before, and if I’ve consumed it at all it can only have been in coffee that was thinned out with chicory. (Does anyone else remember that? It seems not to be a common thing any more to see chicory substituted for coffee, and I for one am glad.) It’s a thin leaf with a prominent center stem, with the leaf serrated along it. I wasn’t sure whether one is supposed to eat the stems as well, but for the sake of keeping my salad bowl from overflowing I discarded the thickest stems. 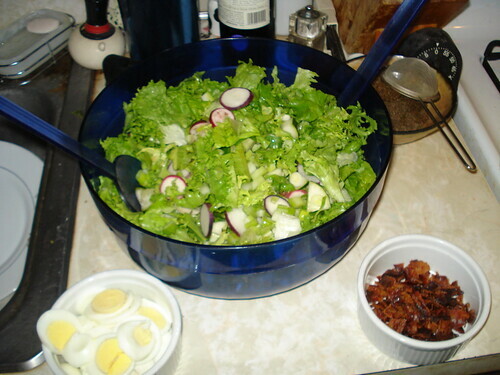 Chicory has a somewhat bitter taste, so it gives some depth to a tossed salad such as this. 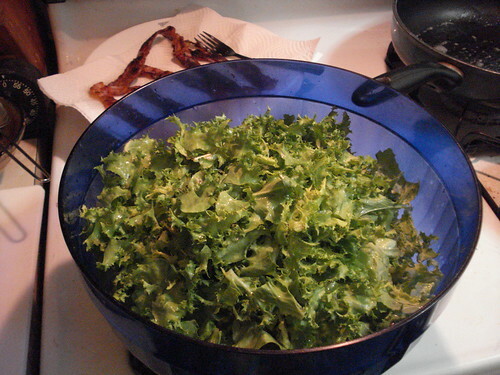 I was also supposed to sprinkle the crumbled bacon over the whole salad and ring the edge with the hard-boiled egg slices. But this week my husband has been waylaid by a gout attack, and he’s been trying to limit his protein intake, so I put the bacon and eggs on the side. I was also supposed to offer an herbed vinaigrette, but we seldom use salad dressing and I found this one quite flavorful enough without it. I did make the orange vinaigrette for the pear salads, though. These were delightful. 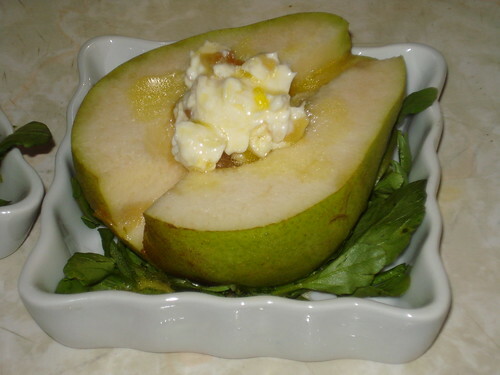 You serve pear halves on watercress; fill the cored middle with a dollop of ginger cream cheese, which is cream cheese mixed with crystallized ginger and a bit of cream for texture; and drizzle on a bit of orange vinaigrette. The ginger cream cheese was so delicious I could hardly see straight. 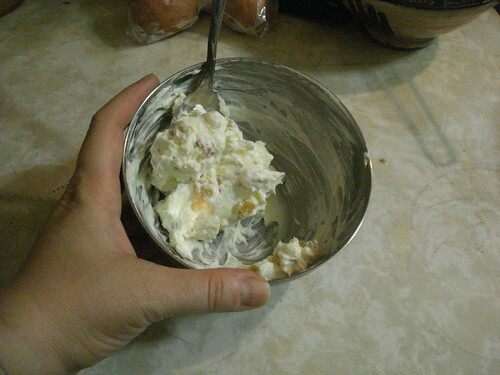 It would be great in other recipes: as a filling for sandwich cookies (ginger or lemon), as a frosting for pound cake, as a ribbon in ice cream. (Seriously, now I really want to get an ice cream maker so I can play in this manner.) The combination of pear, cheese, ginger and orange was refreshing, almost dessert-like. I will definitely be making that one again.